Please note: the text appears in the book in two columns, and is here presented in different format for the reader’s convenience. In the book photographs are printed in separate sections, but here a few are included with the text for the sake of greater clarity. Body adornment was widely used by Aborigines, but many forms appear to have been abandoned quite soon after contact with white settlers, particularly in the south-east of Australia. This means that they are now rarely seen outside museums. Even many Australians are unaware that Aborigines had a rich tradition of adornment which stretches back thousands of years. An example we acquired as part of our collection is a headband of kangaroo teeth held together by string and resin (fig. 1, p. 24). The person who showed this to us thought it was a dogs’ teeth necklace from New Guinea. He had failed to notice that the teeth are completely different: kangaroos are herbivores and their teeth lack the sharp points of those of carnivores. It is, in fact, a 19th century Aboriginal ornament. An example of a similar piece from the collection of the South Australian Museum (fig. 2, p. 24) shows more clearly how it was worn: with the teeth pointing down. Our headband has dried out, as have some others we have seen, into a circular form with the teeth pointing inwards. It could not now be restored to a wearable form without severe damage. The Museum’s headband had been worn by a Tjingili man from Newcastle Waters in the central region of the Northern Territory and was collected in 1891. A variant of this forehead band is one from our collection which has groups of kangaroo teeth set in resin suspended from a fibre headband painted with red ochre and white pipeclay stripes (fig. 3, p. 24). This very early headband was once part of the collection of Stan Moriarty, an enthusiastic Australian private collector best known for his collection of artefacts from Papua New Guinea, notably the Highlands. Headbands made with kangaroo teeth were worn by both men and women in the area around Darwin in the Northern Territory. There is evidence that ornaments made of marsupial teeth have been in widespread use for thousands of years: Aboriginal Australia by Carol Cooper et al. (1981: 73) shows a skull found at the 4000-year old Roonka burial ground on the River Murray in South Australia. It is decorated with a fillet of two rows of notched marsupial incisors attached to the forehead. This adornment of a man’s head has remained remarkably intact over the centuries. In western New South Wales a 6000-7000 year old burial site has been found which included the remains of a large necklace of 178 pierced teeth of the Tasmanian devil, an animal which was extinct on the mainland by the time European settlement began in 1788. The Northern Territory was settled by Europeans relatively late, in 1869, and was administered by South Australia until 1911. Paul Foelsche, described previously, documented the settlement’s development, and the traditional owners of the Palmerston (Darwin) region, the Larrakia people, in great detail. Several of his photographs feature Aborigines wearing kangaroo teeth headbands: both Biliamuk Gapal, an important Larrakia man photographed in 1894, and an Alligator Rivers woman photographed in the 1880s, wear the headband. Many of the men and women in Foelsche’s photographs also wear nose-pegs through a pierced septum, made of wooden sticks or bones. Several have cicatrices, deliberately created welted scars, on the body as well. In addition to the headband, Biliamuk Gapal appears to wear pendants beside the ears which hang from his headband and which look like those illustrated in figure 4 (p. 24). The South Australian Museum’s pair was collected by Sayers during the period 1900 to 1906. The Museum’s description states that these may have been worn as appendages to a headband, and Foelsche’s photograph provides evidence that this was indeed the way such temple pendants were attached. A Miao set of three separate but matching neckrings with ‘zigzag’ patterns, from Jianhe County in Guizhou (fig. 396, p. 245), is no doubt one of the largest and boldest items of neck jewellery one could ever imagine a young girl wearing: the size of the largest ring is 40 by 49 centimetres. Although each ring may be worn on its own, a set of three worn together, though not attached to each other, is common. Our set is made of excellent quality silver, but modern versions often have a very thin coating of silver over base metal, while others are inclined to crumple because they are not solid enough. A plain set of three rings attached to each other by solder and silver wire (fig. 397, p. 245) is smaller, but still weighs an astonishing 1184 grams. It relies for its impact on the simple beauty of its high-grade, almost pure, silver hoops and the elegant spirals at the top. These are some of the most impressive examples of the first style, with its strong emphasis on form. Another piece of semi-circular shape, and of great interest, is illustrated in figures 405 and 406 (p. 250). Under a crescent-shaped top section depicting mythical animals, two human figures, accompanied by two camels, are portrayed on either side of a small table. The figures appear to be naked, with long hair, which hangs down to the ground. The person on the left wears a hat with a feather, the one on the right seems to be a woman, who wears a cap or headband. The facial features and feet and hands are of exaggerated, caricature-like shape, and the pair, who both hold objects which may be spears or arrows appear to be arguing or negotiating. We have seen several versions of this scene. In one such piece the figure on the left wears a crown, while in another the camels have been transformed into a kind of camel-dragon. It must be a scene which depicts a well-known Miao myth or legend, which unfortunately we cannot interpret. What makes the scene the more amazing is the presence of camels, an animal not present in Guizhou, where this piece appears to have been made. Would the ancestors of the Miao have seen camels, which came to China along the Silk Road as far as Xian? This would have been in very distant times in the past when the Miao lived near the Yellow River. It is interesting to speculate, but there may of course be an entirely different explanation. 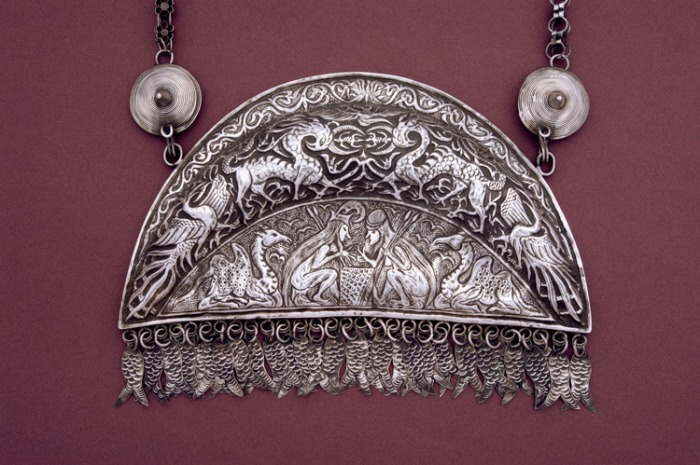 This intriguing piece has dangles of silver fish (symbols of fertility and wealth) and was worn on a finely and elaborately made chain round the neck. A square silver plaque (fig. 407, p. 251), also worn around the neck, which depicts a rider seated on a horse holding a banner, probably portrays a legendary warrior of the tribe. The drawing of the horse is particularly lively.